At the ITbM Gallery, we hold events that promote the understanding of the "Mix" concept. We would like to create an opportunity for the general public as well as NU faculty members and staff to ponder over what the "Mix" concept is. 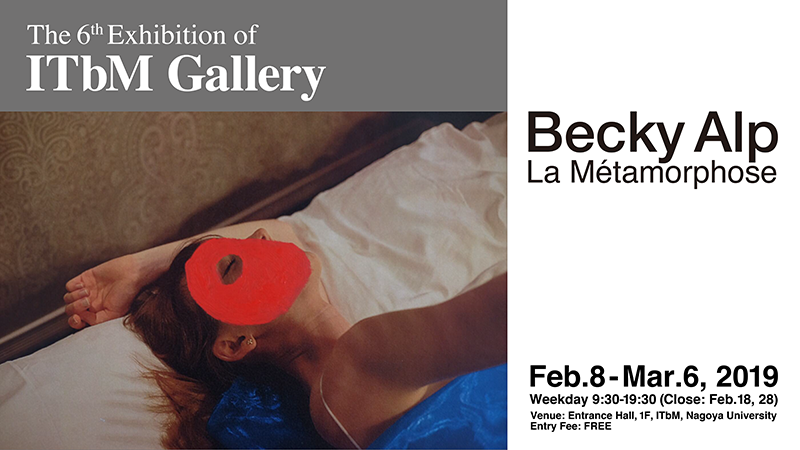 The 6th event at ITbM Gallery presents a series of mixed media work that merges photography with painting by Becky Alp. Berke Alp, also known as Becky Alp, was born in Antalya, Turkey in 1988. Having grown up next to the Mediterranean Sea, her love of the mythological creatures and faraway lands grew tremendously. Throughout her life, Becky has always been fascinated by images and how the world is represented through the eyes of her favorite writers and artists. Her interest in photography was cultivated in her college years in London, England. Becky currently lives and works in Nagoya, Japan. La Métamorphose is her fifth major project.